Havasu Canyon is a paradisiacal gorge where turquoise waters cascade into travertine pools and graceful willows and lofty cottonwoods provide shade and greenery in an extraordinary setting of towering red sandstone cliffs beneath a cerulean sky. It is a side branch of the Grand Canyon that was once the home of a prehistoric people but more recently it has been the occupied by the Havasupai for the past 800 years. Seasonal rainfall, melting snow and percolating water are drained by Cataract Creek which rises on Bill Williams Mountain and crosses the Coconino Plateau. The creek wanders across the high plains for about 50 miles before dipping down into the steep sided Cataract Canyon. Except for flash floods, Cataract Creek is usually a mere trickle until it reaches Havasu Springs where an underground river gushes forth to form Havasu Creek. With a steady flow rate of about 28,000 gallons per minute and a heavy concentration of suspended calcium carbonate, the river bed is rapidly lined with limestone that reflects the sunlight and gives the creek its striking blue-green color. The waters plunge over Navajo Falls, Havasu Falls (100ft. 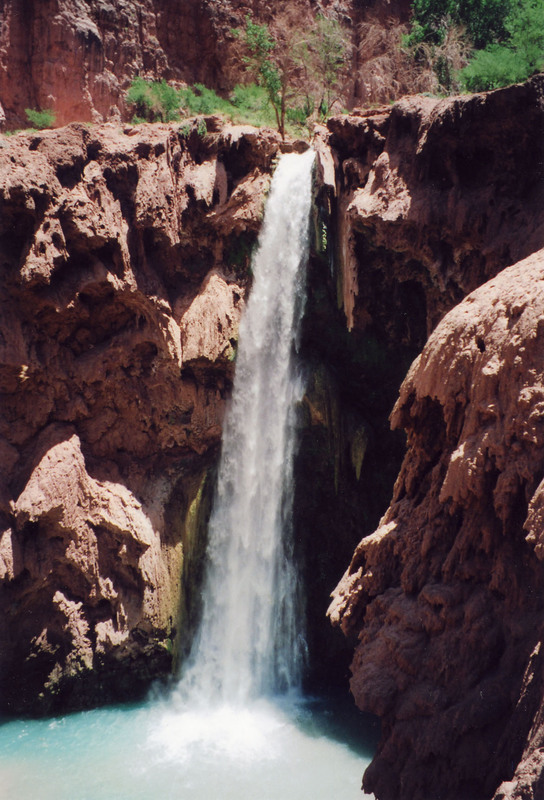 ), Mooney Falls (200ft.) on the way to the Colorado River about ten miles away from Supai Village.Water is especially precious in a dry and arid land and the Havasupai consider the source of this river to be a sacred place that is intimately associated with the legend of their origin. There are legends, too, of their end for they believe that the Wigleeva, two stone pillars that overlook their village, are guardian spirits and their destruction will signal the demise of the Havasupai. 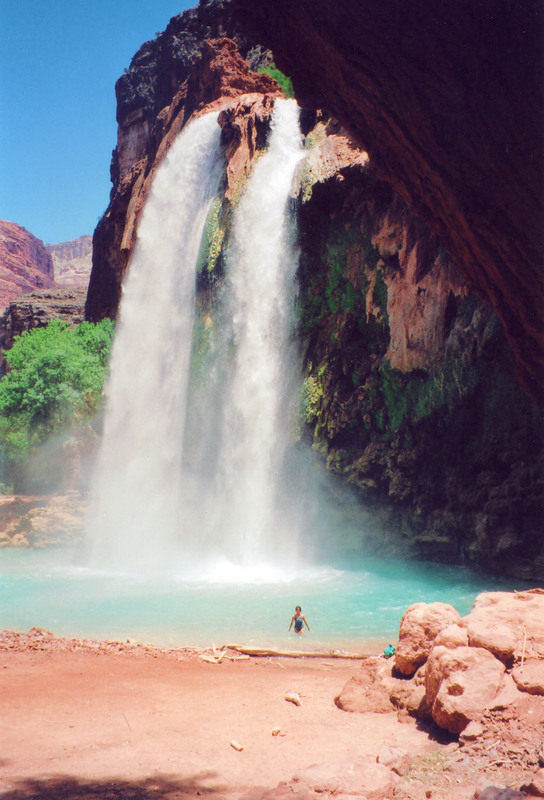 "Havasupai" means "people of the blue-green waters." The Havasupai tribe is the smallest Indian Nation in America totaling about 600 people. Before the arrival of Europeans, they farmed the land where the canyon widened and the plentiful waters of Havasu Creek allowed them to create an emerald haven in a sun scorched land. In the summertime, they grew corn, squash, melons and beans and after harvesting their crops in the fall, they moved to winter settlements on the rim of the canyon where men hunted deer, antelope and small game and women made beautiful baskets. They traded with the Zuni and Hopi exchanging buck skins and red ocher for pottery and turquoise. The Havasupai were renowned for their fine quality buck skins and their powdered red ocher, obtained from a secret place, was particularly prized by other tribes for painting their faces. This idyllic lifestyle was interrupted by the arrival of miners and ranchers who siezed their lands on the plateau and restricted them to a small reservation in the canyon. Almost a century passed before their winter homelands were restored by Congress in 1975. Today, they continue to cultivate their crops but their tanning and basket weaving skills are known mainly to the older people. They have developed a successful tourist industry which brings the outside world within their sphere. However, some people believe this contact increases their struggle to preserve their unique cultural heritage. Father Francisco Garces, a Spanish missionary priest was the first European to visit the Havasupai in their canyon in 1776. He found 34 families whom he described as happy and hard working. Among some of the first prospectors to visit the Havasupai in 1879 was an ex-sailor named Mooney who fell to his death descending the waterfall that carries his name. There was also a young prospector named Dahoney who noticed some unusual pictographs on the canyon walls and the remains of an ancient megalithic fortress perched on the rim of a sheer cliff. Dahoney's observations are supported by Frank H. Cushing's description of his encounter with the Havasupai in 1882. He, too, noted red and white pictographs as well as cliff dwellings and masonry storehouses in the cliffs. Authorities believe that the cliff dwellings and storehouses were built by a prehistoric people unrelated to the Havasupai. In 1924, Dahoney sponsored and participated in a scientific expedition to explore the evidence of prehistoric man in the area. Their findings generated more questions than those answered. Apparently, the red sandstone contains iron that forms a thin black film on the surface of the rock. By cutting through the black film with a sharp instrument, the red sandstone underneath is exposed creating the pictograph. The expedition identified controversial wall drawings of a dinosaur and several ibex. Dinosaur tracks have been found in the area but it is generally held that dinosaurs were extinct for millions of years before the appearance of man. This painting suggests that Paleo-Indians were either much older than originally thought or some dinosaurs became extinct more recently. Also, ibex have never been found in America. These paintings imply otherwise and even today, they remain an enigma to palaeontologists. The ancient fortress, cliff dwellings and wall paintings are located in other areas of the Havasupai Reservation that are not accessible to visitors but this information contributes to our appreciation of the amazing and timeless phenomenon that is the Grand Canyon complex. April to May and September to November are best for a visit to Havasu Canyon because the climate is moderate on the rim as well as on the canyon floor. These months also avoid the heat and crowds of summer. There are no roads to Supai Village so visitors arrive by horse or on foot. The trail begins at Hualapai Hilltop which is a parking area with no facilities. Some hikers overnight at Hualapai Hilltop because it is more comfortable to start the trek in the cool, early morning hours. The nearest towns are Peach Springs and Seligman which are both located on Highway 66 about 68 and 90 miles respectively from Hualapai Hilltop. From Highway 66, take Route 18 north for approximately 60 miles to the trailhead. The sign for Route 18 is obscure, especially in the dark. An early morning drive across the Coconino Plateau can be rewarding for a glimpse of the stately mule deer that browse the shrubs in the pre-dawn hours. The sparse vegetation and dry, rocky soil at the trailhead give no hint of the lush canyon home of the Havasupai at the bottom of Havasu Canyon, 10 miles away. The trail drops steeply by a series of switchbacks into Hualapai Canyon for the first mile and then descends more gradually for a half mile to the bottom of the canyon. Its sheer, massive walls become narrow, blocking the sunlight and distorting the size of giant boulders along the path. Eventually the canyon widens and cottowoods, willows, box elders, hackberry trees and wild grape vines diffuse the harsh sunlight of a mid-morning sun. The path follows a small creek that joins the noisy Havasu Creek at the confluence of the Hualapai and Havasu Canyons. 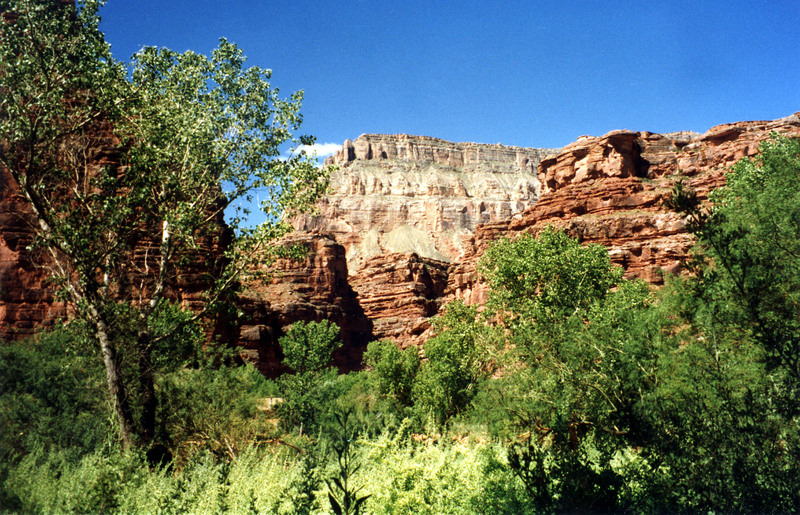 Cattails, maidenhair fern and watercress can be seen along the creek to the village of Supai past peach orchards, fig trees and cultivated fields of corn and alfafa. Campers continue for two more miles to the first campsites. Bring comfortable clothing, swim suit, sturdy walking shoes, brimmed hat, insect repellent, sunblock, camera and lots of film. Ground fires are prohibited so a gas stove is necessary for those who plan to cook. All hikers must obtain advance approval from the Havasupai Tourist enterprise before starting into the canyon. In additon, advanced reservations and a 50% deposit are required for the lodge and the campground. On arrival at Supai Village, visitors register and pay an entrance fee. Amenities include campgrounds, a lodge, a village café, a general store and a post office. All financial transactions require cash except the Camping Enterprise and the lodge where Mastercard, Visa, travelers checks and money orders are accepted. The entrance fee is $20 per person and the camping fee is $10 per person nightly. Horses are available for rent to carry packs or riders. Contact the Havasupai Tourist Enterprise to determine all costs because they are subject to change and may vary with the season. Be sure to pick up any provisions that you may need on Highway 66. There are no service stations or stores along the way. Supplies are limited and expensive at the small general store in Supai Village. It is recommended that you fill your car up with gas and carry at least 2 litres of water per person for the trek to Supai Village. Do give horses the right of way along the trail. Bring an adequate supply of food, especially if you cannot tolerate fried foods. Fresh fruits and vegetables may be limited. Plan to send postcards to your friends. The post office is the only one in the U.S. that is still served by pack train and your mail will bear a special postmark attesting to this. A visit to the small museum in Supai Village is worthwhile. For a leisurely trip to the waterfalls, plan to spend at least 2 nights in the village. Please be respectful of people's privacy as well as their fences. Alcohol, drugs, weapons and pets are not allowed in the canyon. Some helpful tips from Diana O'Brien. The Havasupai Tourist Enterprise approves and organizes visits to the Havasu Canyon and is responsible for collecting entrance fees, camping fees and arranging the rental of horses to carry packs or riders. Pit toilets, potable water and picnic tables are provided at campsites. Havasupai Lodge accepts room reservations for your stay in Supai Village. Rooms have double beds, private bath and air conditioning but no television or telephones. Meals are available at the village café. The Havasupai Tribal Council reviews applications and requests to visit other areas of the Havasupai Reservation. However, permission is rarely granted to the general public and only special circumstances are subject to consideration. Grand Canyon Caverns Inn is situated along Route 66 about 5 miles east of Route 18 and 66 miles from Hualapai Hilltop. A restaurant and convenience store are available but the nearest gas station is located in Peach Springs, 12 miles to the west. Route 66 Motel is a clean, modest motel that is located on Route 66 about 90 miles from Hualapai Hilltop and 29 miles to the east of Route 18. Gasoline and basic supplies may be purchased in Seligman and there is a restaurant nearby. Havsuw 'Baaja: People of the Blue Green Water by Stephen Hirst with photos by Lois Hirst. Mr. Hirst tells the story of the Havasupai from their origins to their century long campaign to regain their winter homeland which was restored by Congress in 1975. Arizona Traveler's Handbook by Bill Weir and Robert Blake is an excellent general guide to Arizona with a wide variety of accommodations that include campsites, hotels/motels and guest ranches. This Moon Publication provides comprehensive outdoor coverage and an informative section on the Havasupai Indian Reservation. Adventure Guide to Arizona by Eleanor Morris and Steve Cohen has an easy to use format that is categorized by region. Extensive adventure opportunities and resources in Arizona are listed and the Introduction section is particularly helpful with lots of advice for planning your Arizona adventure. The Nation of the Willows is a narrative of Frank H. Cushing's visit with the Havasupai Indians in 1882. This charming book describes a peaceable and hospitable people and gives insight to Native Americans who have created a veritable Shangri-la in a desert land.